Know all you can about vinyl before making a purchase. Everyone knows how important it is to investigate all of the flooring options before making a purchase. But purchasing vinyl flooring should be quick and easy, right? Not so fast. The floor covering in your home impacts interior beauty, décor, comfort, livability and upkeep. Any floor can make, or break, a home. So our advice is to take your time and learn all you can before buying vinyl flooring, and you can start right here, right now. In this section we will share with you what you should consider before making a vinyl buying decision. Because knowledge about vinyl traits and subtle differences can be invaluable. Yesterday’s vinyl flooring would be floored with today’s. To understand vinyl, think layer cake. You shouldn’t always pick thick. Top shoppers concentrate on the top layer. Checkout traffic patterns before vinyl patterns. And now, a few lines about seams. Since most vinyl comes in 6’ and 12’ widths, seaming may be necessary depending on the area to be covered. 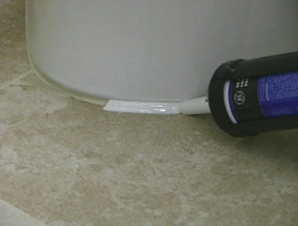 Finally, a word about caulking: be aware that it’s your responsibility to maintain caulking in heavy water use areas. Materials required to complete the installation. Your new vinyl floor may require additional materials, such as moldings, to install it properly. Also, consult the manufacturer’s warranty and care guide for directions on how and how often your vinyl flooring should be cleaned and the cost to clean it. There’s much to consider before buying vinyl flooring. We hope this section has answered some of your questions and underlined the fact that you really can’t learn enough before buying floor coverings for your home.